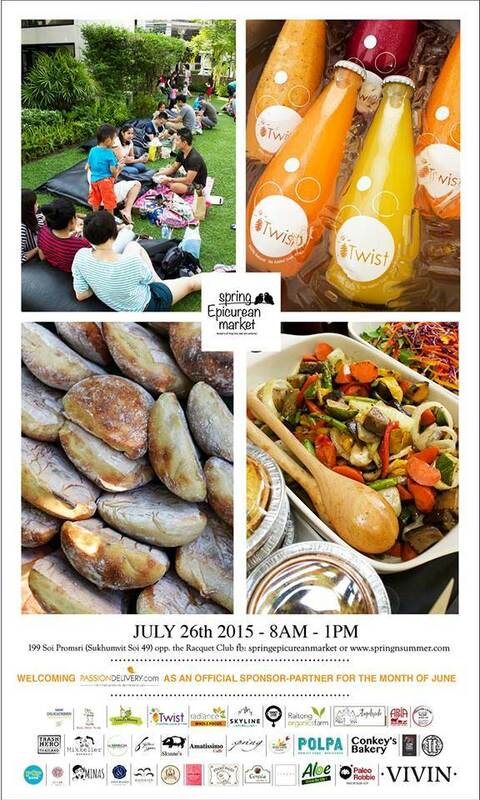 The perfect ingredients for the easiest Sunday morning in Bangkok are green space and fabulous artisanal food. Both can be found at the Spring Epicurean Market when the city’s finest vendors will next gather. The simple charm of free-ranging children, frozen fresh fruit popsicles and comfortable lawn furniture exudes a relaxed garden party vibe where all are welcome. Shoppers truly make themselves at home and plan ahead for this market. Some bring their newspapers while others pack picnic mats and board games. Joe Sloane’s famed barbeque completes the scene. This could be the perfect backyard with great friends and fine food in one place.In their own words here’s why our shoppers love the market. Juices, will next be held on Sunday July 26, 2015. All are invited.